I'll let you in on a secret. Since my teenage years, I've been obsessed with my hair. It's been a love/hate relationship and we've seen ups and downs together. But it was not all in vain, as I can now say I have normal hair, as opposed to the greasy mess I had when I was in that ungrateful period that was high school and teenage years. Here are the products that help me keep my mane in a presentable state! I've already talked about this combo in a review. Tea tree is the perfect ingredient for those who struggle with oily everything. I've been using these for almost a year and I've now tried another range from Giovanni (the 50:50 one) but I prefer the Tea Tree Triple Treat. I'll finish the 50:50 and then I'll be back on it. I even converted my mother on Giovanni products, as she's been struggle with frazzled hair after chemotherapy. I find Giovanni products at Loblaws, Winners or natural product stores. Well technically it's not my favourite dry shampoo, as I prefer the Klorane one, but as it is expensive ans is never on sale anymore, I turned to Batiste. Now, I hate the original Batiste. But I like the Blush version. It's not just about the fragrance, I find that the original leaves a white cast and is more difficult to work into the hair. But the Blush one is easier. And then you don't have that problem with Klorane. Oh well! You've been living under a rock if you don't know the buzz that has been around organ oil in the last 5 years. It has been used for centuries by Moroccan women to moisturize their hair and body but the the mainstream beauty industry has taken it over and put it in their products. Of course, it is just a buzzword for them but the authentic organ oil is the way to go. If my hair need a bit of shine, I put a tiny bit in my hands, rub them together and apply on my hair. Or you can use it as a mask. I love rose scented products. And sometimes I want my hair to smell like them. This is perfect to give my hair a little bit of scent. It is not overpowering, and it is a good thing, as I feel I would struggle with migraines if so, as I am sensitive to scents. Yeah, I know, you'll say "A product that uses organ as a buzzword." But it actually is the third ingredient on the list so it's no added there as an afterthought. It is really good to leave the hair feeling silky and smelling luxurious. I found this bottle in France, at the famous CityPharma, but I also found this product at Winners, so decided to include it in this list. I also could've include Nuxe Huile Prodigieuse, but this product is harder for me to work with and I would recommend to those with dry hair. This will be the most controversial product on the list because it contains silicone. But I've been using it since my late teens and I've tried other similar product without the silicone and it's just not the same. I've never really had problems with buildup, so I continue to use it, but I know it could be harmful to the environment. I am still on the lookout for an alternative though. 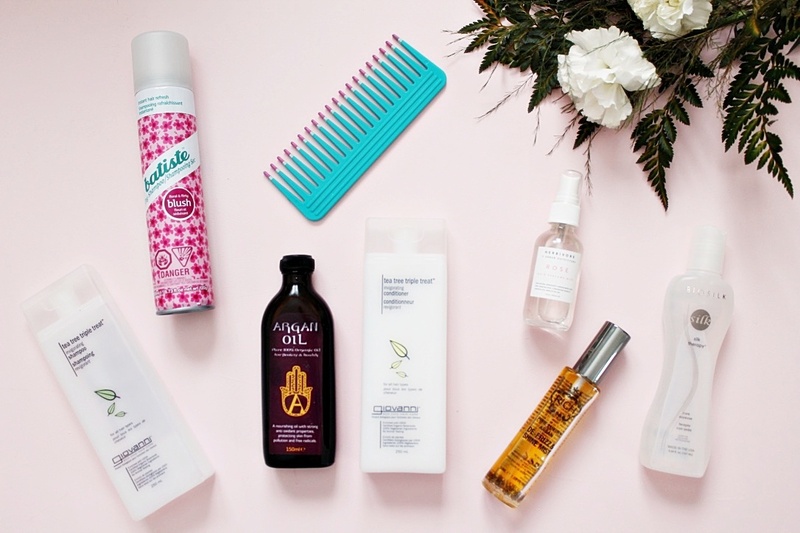 There you have it, my favourite haircare products! Let me know what are yours!